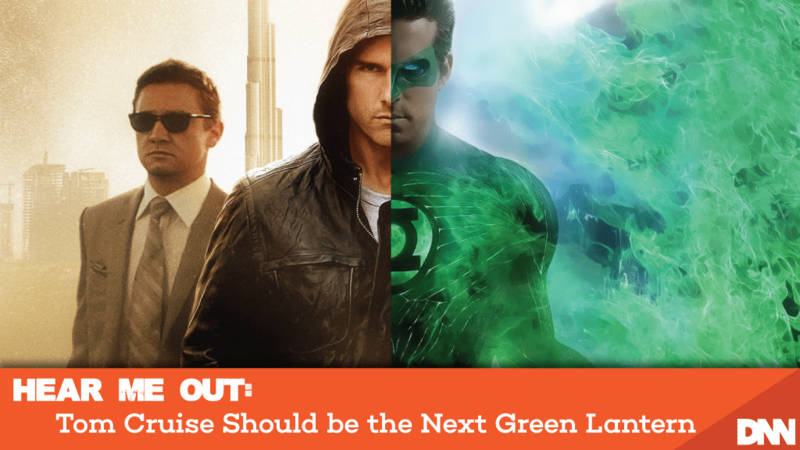 If all the hype from earlier this year is to be believed, Tom Cruise is in the running to be the next cinematic Green Lantern. Yeah, you’re upset, everyone’s upset, nobody likes DC movies, I get it. If you can, though, I’d like you to set all that aside for a brief thought experiment. First of all, I want you to forget everything about Tom Cruise’s personal life; his couch-jumping, his choice of religion, his height – put it all away. You can even forget the majority of his career. For our purposes, we’re only concerned with his work on the Mission Impossible franchise. Over 22 years and six films, we’ve watched Ethan Hunt transform from a young, mentally and physically capable field agent into what I can only describe as the closest thing to a superhero that exists in the M:I universe. At one point in Rogue Nation, CIA Director Hunley (Alec Baldwin) says, with absolutely zero irony, “Hunt is the living manifestation of destiny” – and it’s true. Part of the fun of the Mission Impossible movies is watching Ethan and his crew pull off progressively crazier missions, and watching Tom Cruise do his own increasingly ridiculous stunts. Six movies deep, this has led to a point where, when asked how he’s going to accomplish a given impossible task, Ethan’s only response is “I’m working on it.” At a certain point, Ethan is running off nothing but his own willpower. Which brings us to Hal Jordan. Hal’s a cocky, capable 30-something-ish pilot, ready to take on whatever’s presented to him. Pow! An alien crash lands on earth; turns out he’s an intergalactic space cop armed with the most powerful weapon in the universe, a hard-light construct ring powered by the user’s will. The ring determines that Hal has the ability to overcome great fear, and welcomes him to the Green Lantern Corps. Across Hal’s adventures, we watch him do everything from handling minor space crimes, to protecting Life itself from a malicious and vengeful god. Hal has been described as the greatest Lantern. He’s come back from the dead more times than I can remember. Every time it looks like the situation’s hopeless, Hal pulls through with one thing: the strength of his willpower. The parallels between Ethan Hunt and Hal Jordan are obvious. I defy you to tell me Tom Cruise can’t play a charming, strong-willed super hero. He’s done it six times (well, five. Mission Impossible 2 was a garbage fire).